Today VoiceBox Technologies announced that it has entered into an agreement with Toyota motor sales to develop innovative car voice products and capabilities. Toyota is an industry pioneering adopter of voice technology and started deploying VoiceBox for advanced voice capabilities in the 2009 Lexus. More recently, Toyota is using VoiceBox in its Toyota Entune multimedia system. under the terms of this agreement Toyota and VoiceBox will deliver in car voice innovations exclusive to Lexus and Toyota. VoiceBox is opening a location in Japan to catalyze these initiatives and voicebox is expanding its engineering effort to dedicate more resources towards research and prototyping. Toyota plans to use Voicebox technology in its award-winning Toyota Entune multimedia system. The Toyota Prius C is a slightly smaller Toyota Prius four door hatchback, aimed at the younger generations and set to take on sporty hatchbacks like the Mazda 3 and Honda Fit. With the Ford Sync AppLink system close behind, the Toyota Entune infotainment system comes out as the winner. A study of five production ready applications for vehicles showed that the Toyota Entune and Ford Syn apps achieved industry leading performance on at least four criteria. Criteria such as content variety, level of integration, implementation, and daily relevance. Among the 5 car apps compared, Toyota Entune ranked as the top overall, placing first in 3 of 4 categories, and placing second to the Ford Sync system with implementation. Toyota Entune offers a variety of content from the cloud. The only thing Toyota Entune was missing compared to other systems was the social networking feature. Despite it’s great options, the Toyota Entune system is still expensive at $150 a year when compared to the car apps from other manufacturers. The European spec version of the Toyota Entune system is called the Toyota Touch, and the advanced system called the Toyota Touch and Go. 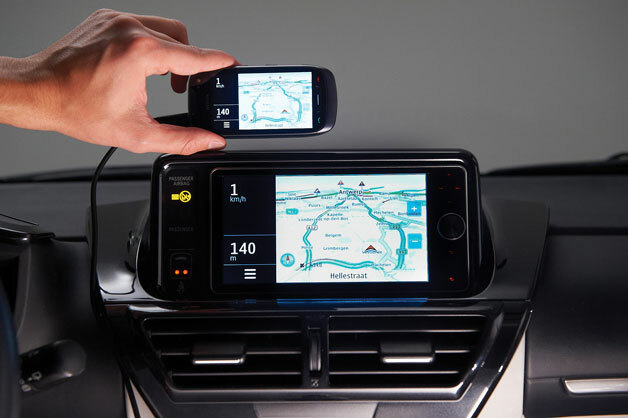 On Toyota’s iQ (not the Scion iQ) in Europe, Toyota just announced that the Toyota Entune / Touch system is the first platform to support the Car Connectivity Consortium’s MirrorLink technology. MirrorLink technology ports an exact replica of the smartphone’s display to the iQ’s seven inch touchscreen. So far, Nokia has a car-mode app that allows their phones to pass display data to the Toyota Entune / Touch system. Applie iPhone users will soon be able to download an application as well. Over the past weeks, here at the Toyota Entune Forum we’ve seen a bunch of questions all centered around the Toyota Entune language support. * Are there different languages for Toyota Entune? * How many languages does Toyota Entune support? * Does Toyota Entune have multiple languages? * What languages does Toyota Entune support? After thoroughly looking over the Toyota Entune website, we couldn’t find any information that talked about multiple languages, but we also couldn’t find any information that said Entune was only available in English. So, we decided to ask Toyota. We appreciate your interest in the Entune system. Per our resource, the system does not support additional languages at this time. If in the future it may remains to be determined. I didn’t bother asking them what resource they were talking about, as the main Toyota Entune site sure didn’t list that information in any place that was easy to find. Even as a fan of the Toyota Entune system and of the Toyota Entune forum, tt’s been a while since I’ve been to Toyota’s official Toyota Entune site. Toyota has some nice videos up there including animations that give a quick overview of the different Entune features and why someone would find them useful. The Entune website also has a video on getting started, how to use the Toyota Entune multimedia sysem. If you get stuck, feel free to come back to the Toyota Entune Forum and post your questions there. If you’re having trouble with your Toyota System not being able to connect to the internet, check out this post: Toyota Entune Forum: can’t get online?